Society’s dependency on smartphone technology has undoubtedly benefitted the fashion industry worldwide. Gone are the days where cell phone users were limited to the cases and tech accessories available at the storefront of their service provider or local office supply store. The iPhone opened the door for upscale accessories including designer phone cases, handbags created to fashionably (and conveniently) hold the iPhone’s slender structure, and even winter accessories that allow users to engage with touchscreen technology without removing their gloves. Enter Echo Design Group – a prominent fashion designer and retailer specializing in home décor, stationary, women’s handbags, scarves, and other cold weather accessories including the aforementioned touchscreen compatible gloves. Since November 2013, Echo Design Group has been aggressively filing lawsuits against major fashion brands, designers and high-end retailers alike for alleged infringement of its U.S. Patent 8528117 titled “Gloves for Touchscreen Use.” The most recent fashion heavyweight involved in this patent controversy is American fashion designer and former Project Runway judge, Michael Kors. On February 24, 2014 Echo Design Group filed a complaint against Michael Kors (USA), Inc. and Michael Kors Stores LLC., in the United States District Court, Southern District of New York for patent infringement of Kors’ Touch Screen Zip Glove. Just weeks earlier, in January 2014 Echo Design Group filed a similar complaint against Henri Bendel in the United States District Court, Southern District of New York for patent infringement of Bendel’s NB Polka Dot Glove. But Michael Kors and Henri Bendel are not the only designers facing legal threats for their touchscreen compatible gloves. 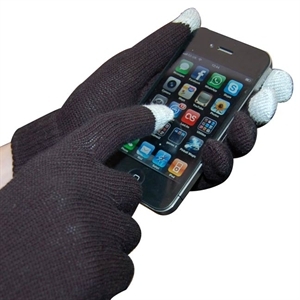 Echo has targeted other fashion designers for alleged infringement of the same patent, filing at least four other lawsuits in November 2013 against the likes of Fownes Brothers & Co., Inc. for the Touchscreen Compatible Gloves sold under UGG, G-III Apparel Group, Ltd., for the Calvin Klein Text Enabled Gloves, Kate Spade for the iPhone Gloves sold under the Jack Spade brand, and Marc Jacobs International, LLC. for the various touchscreen gloves retailed under the brand. All of the filed complaints state that Echo invested significant time and resources into developing the touchscreen glove concept and that Echo secured intellectual property rights to the “Gloves for Touchscreen Use” on September 10, 2013 when USPTO (the Patent 117) issued U.S. Patent No. 8528117 to Echo. The complaints allege that all of the defendants “without permission or license from Echo, has made, is making, is having made, has sold, is selling, is causing to be sold, has offered for sale, is offering to sell, is causing to be offered for sale, and/or has imported, is importing, and/or is causing to be imported into the United States, within this State and elsewhere, of the products. The products directly infringe, contributorily infringe, and/or induce others to infringe, at least one claim of the ‘117 Patent, including but not limited to claim 1, in violation of 35 U.S.C. § 271.” Echo is seeking damages, preliminary and permanent injunction and fees. It will be interesting to see whether Echo succeeds in its myriad of lawsuits against the fashion industry. Kimareanna Ross, Daughter Protecting Parents Brand: Michael Kors, Henri Bendel, Calvin Klein, Kate Spade, UGG Sued, Accused Of Infringing Touchscreen Glove Concept, Fashion L. Blog (Feb. 27, 2014), http://thestyleofthecase.com/2014/02/27/daughter-protecting-parents-brand-michael-kors-henri-bendel-calvin-klein-kate-spade-ugg-sued-accused-of-copying-touchscreen-glove-concept/. Amber Ryland, Project Runway Star & Designer Michael Kors Sued, Accused Of Stealing Touchscreen Glove Concept, Radar Online (Feb. 26, 2014, 4:03 AM), http://radaronline.com/exclusives/2014/02/michael-kors-designer-sued/. Kimareanna Ross, Echo Design Sues Marc Jacobs For Infringement, Fashion L. Blog (Dec. 18, 2013), http://thestyleofthecase.com/2013/12/18/echo-design-sues-marc-jacobs-for-infringement/.